It began with iPhone. Then came iPod touch. Then MacBook Pro. Intuitive, smart, dynamic. Multi-Touch technology introduced a remarkably better way to interact with your portable devices — all using gestures. Now we’ve reached another milestone by bringing gestures to the desktop with a mouse that’s unlike anything ever before. It's called Magic Mouse. It's the world's first Multi-Touch mouse. And while it comes standard with every new iMac, you can also add it to any Bluetooth-enabled Mac for a Multi-Touch makeover. Magic Mouse uses powerful laser tracking that’s far more sensitive and responsive on more surfaces than traditional optical tracking. That means it tracks with precision on nearly every surface — whether it’s a table at your favorite cafe or the desk in your home office — without the need for a mousepad. Magic Mouse connects wirelessly to your Mac via Bluetooth, so there’s no wire or separate adapter to worry about. Pair Magic Mouse with your Bluetooth-enabled Mac and enjoy a reliable and secure connection up to 33 feet away. When you combine Magic Mouse with the Apple Wireless Keyboard, you create a workspace free of annoying cables. And because Magic Mouse is wireless, it can venture beyond the confines of your desk. 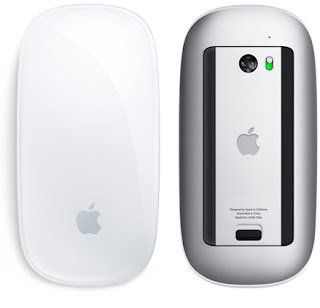 A quick flick of the on/off switch helps conserve battery power while Magic Mouse is tucked in your bag. Even when it’s on, Magic Mouse manages power efficiently, by detecting periods of inactivity automatically. Make one great gesture after another. Multi-Touch technology on the iPhone and iPod touch introduced a breakthrough way to interact with your content. Magic Mouse, with its Multi-Touch surface, does the same thing for your Mac. When you use gestures, it’s as if you’re touching what’s on your screen. For instance, swiping through web pages in Safari gives you the feeling of flicking through pages in a magazine. And scrolling with Magic Mouse isn’t your everyday scrolling. It supports momentum scrolling (similar to iPhone and iPod touch), where the scrolling speed is dictated by how fast or slowly you perform the gesture.